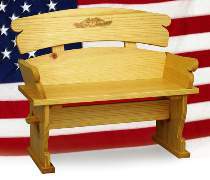 A sturdy bench for the hall or garden. Make it from 1-1/2” stock. All patterns drawn FULL SIZE. Measures 47” wide with an 18” seat height.